The Kingswood Oxford varsity hockey team has resumed its winning ways and is having an impressive season. The Wyverns have gone three games without a loss, posting a 2-0-1 record in that span to raise their record to 6-4-1 on the season. The Wyverns posted an 8-2 victory at South Kent and then battled St. Luke’s to a 2-2 tie on Friday afternoon. St. Luke’s won the first meeting between the teams, 4-1, on Jan. 12. 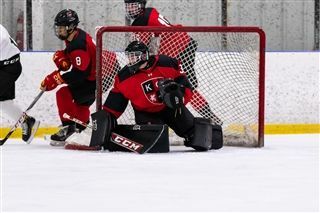 In its latest game, Kingswood Oxford skated to a 7-2 victory at Hamden Hall on Wednesday. Defensemen Cohl D’addabbo ‘21 had two goals and an assist to lead the Wyverns scoring attack. Jack Gao ‘19 added a pair of goals and Kingswood Oxford got a boost from its special teams. After a scoreless first period, the Wyverns fell behind in the second period before they came roaring back to score three consecutive goals including two short-handed tallies. Shane Dawson ‘20 and Karstian Lang ‘20 both scored shorthanded and the Wyverns got power-play goals from D’addabbo , Gao and Kyle Frankel ‘21. KO outshot Hamden Hall 36-27. John McLaughlin ‘20 had 25 saves in net for KO. The Wyverns will look to continue their strong recent play on Saturday when they host Rye Country Day on Senior Day. Kingswood Oxford then is at Harvey School on Feb. 13 and hosts South Kent to close out the regular season on Feb. 15.